The denseness of the dark will be freed so that it can be cleared. You will see their clearing from the Earth and when you do, you will know this is the moment of change, this is the moment of the beginning of the clearing. We are beginning on the upward path toward enlightenment and the turn is here. This is a truly exciting moment. I sense we will see the rapid exposure of those who have sought to control humanity and the darkness of their deeds - deeds that will astonish many and for others will represent a great sense of victory and of liberation from the tentacles of those that have worked so diligently to strangle the freedom and the creativity and inherent love of humanity for their fellow man, for nature, for planet Earth and all of creation. It will be like the proverbial scales falling from the eyes of humanity. 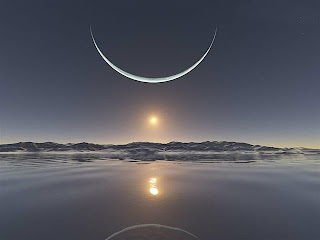 The secrets of the light and the dark upon this planet will come forth before the end of 2012 and this eclipse marks the beginning of this breathtaking array of revelations. Click on http://preview.tinyurl.com/ks9dta to listen to the complete, beautiful messages from Mother Mary and Jeshua.